I had some fresh thyme leftover in the fridge from baking a Sicilian whole orange cake, and planned to use it in a batch of lemon-flavored dinner rolls. Then it occurred to me that lemon and thyme would be even better suited for challah, with its rich, brioche-like consistency. Lemon zest adds a hint of citrus to the dough, but lemon juice in the egg wash really amps up the flavor. 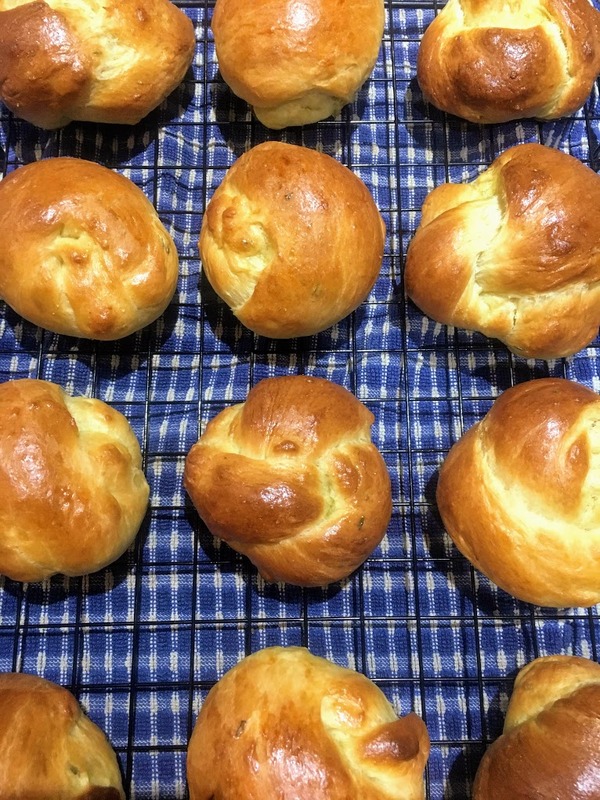 Thyme, a member of the mint family, lends a subtle earthiness to these rolls, which I adapted from my go-to challah recipe in Evelyn’s Raab’s The Clueless Baker. With their shiny glaze and knotted shape, the rolls look impressive. However, the dough would be equally stunning in the form of a traditional braided loaf. In a large mixing bowl, combine 2 cups flour, salt, sugar, and yeast. Stir in water, olive oil, and eggs until smooth. Add thyme leaves and lemon zest. Stir in remaining flour, one cup at a time. Turn onto a floured surface, and knead until smooth and elastic; the dough should spring back when touched. Return to bow, cover with a towel or plastic wrap, and let rise in a warm place until doubled in size, around 30-45 minutes. On a lightly floured surface, divide dough into 14 equal-sized pieces. Roll each piece into a rope using the palms of your hands, and tie into a knot. Tuck ends underneath. Place several inches apart on parchment-lined baking sheets. Cover with plastic wrap or a towel and set aside in a warm spot to rise, around 20 minutes. Meanwhile, preheat the oven to 375 degrees F and prepare the egg wash: in a small bowl, beat egg. Stir in water and lemon juice until thoroughly combined. When rolls have nearly doubled in size, brush with egg wash and bake for 20-25 minutes, until golden brown. The bottom of each roll should sound hollow when tapped with a finger. Store at room temperature in a Ziploc bag or sealed container. ....and quite well as well ! !